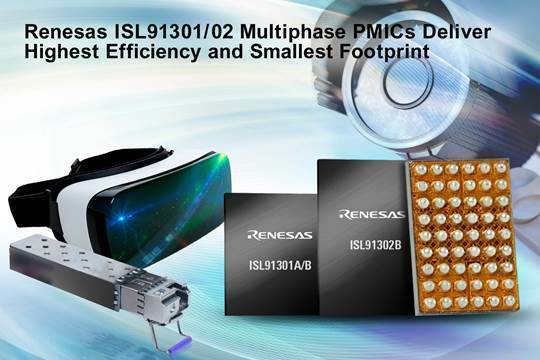 Renesas Electronics Corporation announced three programmable power management ICs (PMICs) that offer the highest power efficiency and smallest footprint for application processors in smartphones and tablets: the ISL91302B, ISL91301A, and ISL91301B PMICs. The PMICs also deliver power to artificial intelligence (AI) processors, FPGAs, and industrial microprocessors (MPUs), and they are ideal for powering the supply rails in solid-state drives (SSDs), optical transceivers, and a wide range of consumer, industrial and networking devices. The ISL91302B dual/single output, multiphase PMIC provides up to 20A of output current and 94 percent peak efficiency in a 70mm2 solution size that is more than 40 percent smaller than competitive PMICs. 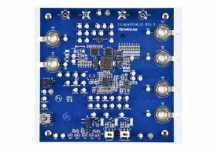 The ISL91302B dual/single output PMIC is available now in a 2.551mm x 3.670mm, 54-ball WLCSP package and is priced at $3.90 USD in 1k quantities. For more information on the ISL91302B, visit intersil.com/isl91302B. The ISL91301A triple-output PMIC and ISL91301B quad-output PMIC are available now in 2.551mm x 2.87mm, 42-ball WLCSP packages, both priced at $3.12 USD in 1k quantities. 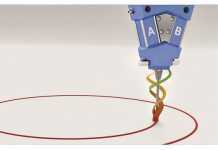 For more information on the ISL91301A, please visit intersil.com/isl91301A. 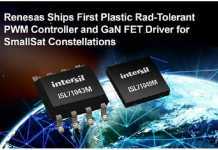 For more information on the ISL91301B, please visit intersil.com/isl91301B.